Kevin Connor has lived and worked in Sydney for most his life, apart from periods of painting and study in London, Paris, New York, Spain and Egypt, with extensive travels in Europe, the USA and the Middle East. Connor is one of Australia’s finest urban expressionist painters known for his ability to capture the vibrancy and dynamism of unassuming scenes of the inner city and its various inhabitants – café goers, faceless vagabonds and anonymous passers-by. Connor’s figure compositions and city scenes have long been a strong subject matter in his work since the early 1980’s. As a great observer, Connor can often be found sketching from life in his notebook in the streets of Sydney, Paris, New York and London. 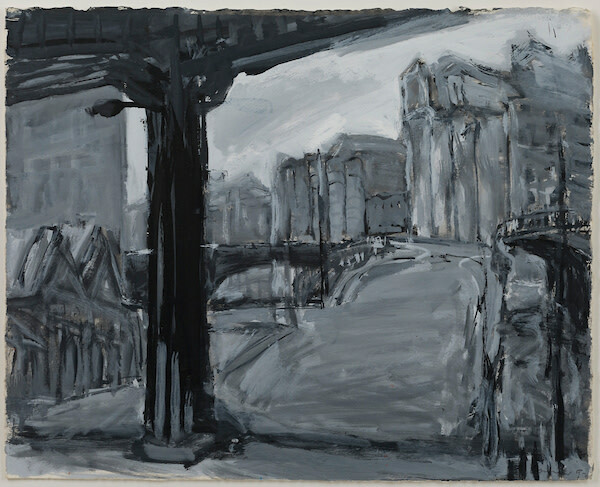 Representing his own narrative of a place whether in paint, charcoal, ink or gouache, Connor’s view of the city is often a lonely place of flux. Although drawn from life, the paintings are occasionally memory-based or imaginary scenarios of a location’s history where the characters are captured in a moment in time. Often these paintings are reduced to abstract expressions of colour and texture.